While plenty of steps would be needed to make it a reality, concerns are being expressed about the potential for a New England Revolution stadium in South Boston. The Revolution have played at Foxborough, MA’s Gillette Stadium since its opening in 2002, and share it with the NFL’s New England Patriots. It has been believed that the Kraft family, which backs both the Patriots and the Revolution, will push to move the Revolution into a new soccer-specific stadium that is in or at least closer to downtown Boston. No firm plans have emerged at this stage, but one site that has been speculated as a candidate for a future stadium is a city public works yard in South Boston located on Frontage Road. “This is a long way out. I don’t have, per say, a vision, but certainly there’s an opportunity for housing, economic development, for a whole bunch of things, for some more open space,” he said…. Gillette Stadium’s large configuration and suburban setting standout as contrasts to current MLS facility planning trends, which are leading to more soccer-specific stadiums being constructed in urban areas. 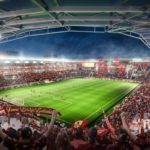 That is why the Revolution’s potential stadium plans have been the subject of intrigue, and the club has made a fairly recent run at a soccer-specific stadium. The most high-profile effort of late, the pursuit of a new stadium at the site of the former Bayside Expo Center in Dorchester, fell through last year when negotiations ended. Photo from the New England Revolution home opener, 2014, via flickr.com. RELATED STORIES: The Search for the Next Big Thing: MLS Facility Planning; Ground Broken on New England Revolution Training Center; Boston Soccer-Specific Stadium Still Targeted by Revolution; New New England Revolution Stadium on Tap? 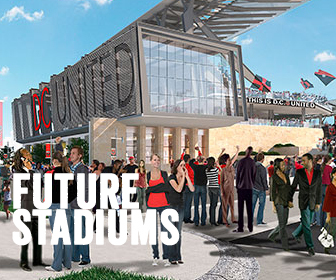 ; Boston Soccer-Specific Stadium For Revolution Still Discussed; With Dorchester Dead, Krafts Mull New England Revolution Stadium Locations; New England Revolution Stadium Discussions Cease; New England Revolution Hit Roadblock in Stadium Talks; Baker Open to New England Revolution Stadium; Boston Mayor Expresses Traffic Concerns about Bayside Site; Revolution Began Bayside Pitch Last Fall; Bayside Expo Center Emerges as Potential Site for New England Revolution Stadium; Krafts bring in Goldman Sachs on new Boston MLS stadium plan; New Boston MLS stadium talk heating up again; New Revolution stadium in motion? ; South Boston site eyed for new Rev stadium; After Revolution uprising, will we see soccer-only stadium in Boston?